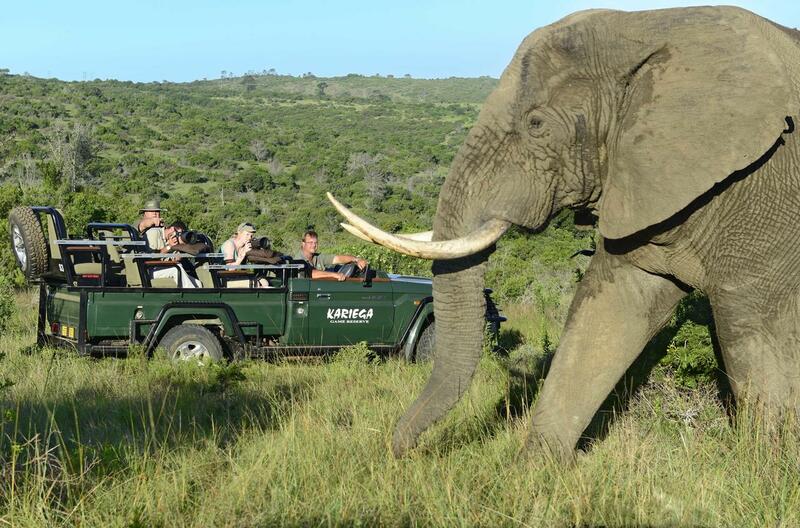 Family-owned and operated, Kariega Game Reserve spans 10 000 hectares of pristine Big Five wilderness in a malaria-free wildlife wonderland in the Eastern Cape. Among the inhabitants of the reserve are lion, elephant, leopard, buffalo, rhino, hippo, hyena, giraffe, zebra, warthog and a variety of antelope. Bird species include the prized martial, crowned and fish eagles. Main Lodge accommodates guests – including families – in en-suite, air-conditioned log chalets, each with large private viewing deck, spacious lounge and living area. Traditional meals are served in the restaurant or boma. Ukhozi Lodge comprises 10 luxuriously romantic, log-crafted and air-conditioned suites, each with a private plunge pool and deck offering wide valley views. The central lodge features African-style lounges, restaurant and boma, and swimming pool. River Lodge offers accommodation in spacious, air-conditioned suites under thatch, dotted along the banks of the Bushman’s River. The setting is unique in that the Big Five reserve meets the sea in this beautiful location. Daily river cruises ferry guests through the village of Kenton-on-sea to picturesque beaches. The Homestead offers all the luxury and exclusivity of a sole-use home in a remote wilderness area. In order to tailor-make their stay, guests have access to a dedicated game ranger and chef. With 7 spacious bedrooms (5 en-suite and 2 sharing a bathroom), a bar, swimming pool, satellite TV, playroom for children and spectacular views, it is perfect for the sole use of a group or family of 10-14 persons. Settler’s Drift is a luxury tented lodge – a more recent addition in the Kariega Game Reserve – accommodating guests in 9 gorgeous tented suites. Children: All Ages at Main Lodge and The Homestead. 10+ at River Lodge, Ukhozi Lodge and Settler’s Drift. TGCSA Grading: Four-Star, except for Settler’s Drift which is Five-Star. There's currently no specials at Kariega Game Reserve. The conference venue at Kariega has seating for 80 people.